Its a chilly morning and as I watch the soft snow come down through my window, I am so happy to be sitting on my window with this delicious and warm bowl of banana and chocolate oatmeal! 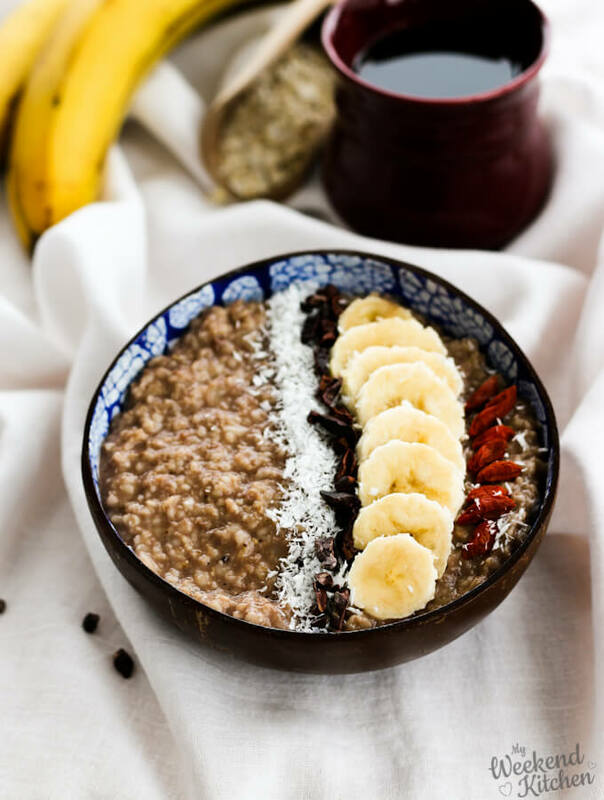 Banana and chocolate oatmeal – comfort in a bowl! It’s been that kind of couple of weeks here in Bucharest when you wake up to a blanket of snow and more snow during the day! While I love homemade granola with cold vegan milk for breakfast, on cold mornings like these, my heart craves for a warm bowl of oatmeal. Oatmeal or porridge is a delicious and healthy way to start the day. Banana and whole grain oats provide enough energy to start and sustain you through the morning. Oats have complex carbohydrates that release energy slowly and thus keep you full for longer and control the mid-morning snacking. How to make basic oatmeal? Basic oatmeal is very simple to make. Just cook in 3 times the water until soft and mushy and then add some maple syrup or fruit compote on top. Today I felt like playing a little with my traditional simple oatmeal recipe. We had a few bananas lying around and I had just bought a pack of cacao nibs that was lying on the counter. That’s how today’s flavor of banana and chocolate oatmeal was decided! 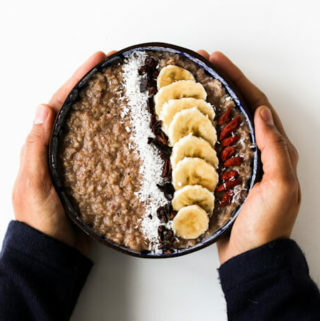 How to make Banana and chocolate oatmeal? You can add additional flavors and fruits to the oatmeal while cooking the oats or as the topping. I like to do both! I mashed half the banana and added to the oats while cooking the porridge and remaining half I sliced and added as the oatmeal topping. Cook the oats with 3 times the water until they are thick and creamy. Takes about 10 mins. Add mashed banana and cocoa powder. Mix well. Serve and add toppings of your choice. For the chocolate, I added cocoa powder while cooking the oatmeal and cacao pieces as toppings. A little ground cinnamon added while cooking brings in the winter warmth. For toppings, apart from banana and cacao nibs, I sprinkled some desiccated coconut and goji berries for a splash of colors on the deep chocolatey oatmeal bowl. have banana? make banana oatmeal! 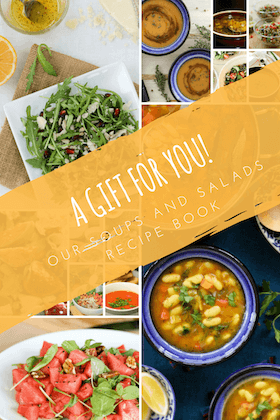 If you like this recipe, I would really appreciate if you can rate it below and/or leave your feedback in comments. It will encourage me to keep learning, improving, and sharing. Healthy and hearty this banana and chocolate oatmeal is a delicious breakfast. 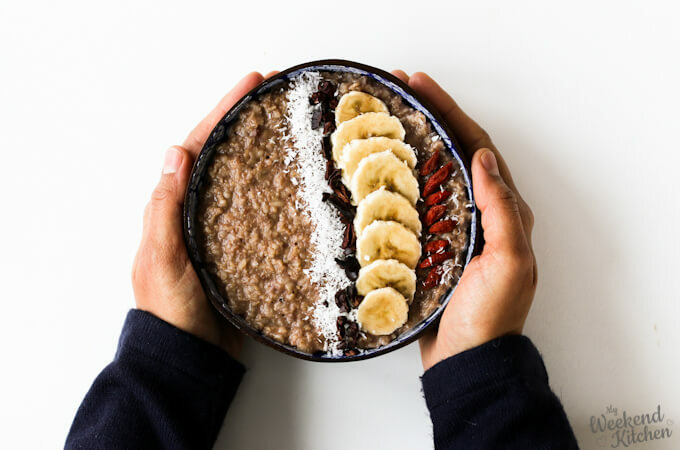 The goodness of whole grain oats and bananas fills you with healthy energy to start the day and keeps you full for a good part of the morning. Ready in just about 20 minutes, it’s an easy breakfast idea even for rushed mornings! Bring 3 cups of water to boil in a stockpot. Mash half the banana with the back of a fork and slice the remaining half. Keep aside. Once the water comes to boil, add oats and mix well with a wooden spoon. Cover till there is a boil. About 2-3 minutes. Reduce the heat and continuously stir the porridge for about 6-7 minutes till it becomes thick and creamy. Add the mashed banana and cocoa powder to the oats. If you find the oatmeal super thick, add just a little more water or any vegan milk to loosen it a little. Mix well until the cocoa powder is well mixed and cook for another minute. Remove into bowls. Taste and see if you need some maple syrup or not. Top with the remaining sliced banana. Optionally add cacao nibs, desiccated coconut, and goji berries. Enjoy warm. Use slightly ripe bananas for making the oatmeal. Bananas are naturally sweet and you might not need to add any maple syrup or another sweetener. Nutritional information is approximate information for 1 serving of the oatmeal without the optional toppings. The difference between oatmeal and porridge is pretty much a matter of language choice. Technically oatmeal is a kind of porridge but the two words are often used interchangeably. Porridge is warm cereal that can be made with different grains but oats porridge is the most common and thus when you say porridge, it usually refers to one made with oats. Oatmeal is used for both coarse oats flour (like almond meal) and for oats porridge.